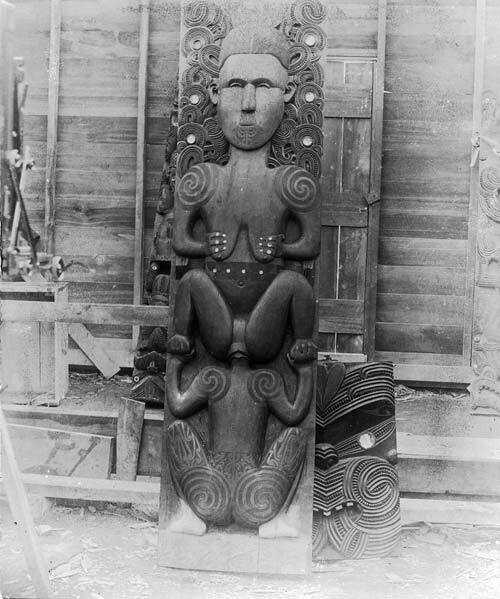 This carving by Tene Waitara, for the meeting house Rauru at Whakarewarewa (opened in 1900) depicts the demigod Māui trying to enter the body of the death goddess Hine-nui-te-pō. According to the legend, a watching fantail (or, in some versions, a moho pererū or banded rail) laughed so loudly that it woke the giant Hine-nui-te-pō, who then crushed and killed Māui between her legs. In Māori mythology, as in other cultures, humour and tragedy are often closely interlinked.